Year after year after year, I make resolutions. And year after year after year, I break resolutions. Except more than break them, I just... forget they were resolutions. I sometimes manage to do what I resolved to do, but that is generally haphazard and almost accidental; the fact that I ate more vegetables in 2013, for example, had very little to do with the fact that I resolved to do so in January, and very much to do with the fact that I discovered how much I like roasted Brussels sprouts. In 2014, I tried something different: I made resolutions that were more like un-resolutions: sleep, eat more chocolate, run in new places. I hoped to make them fun, so I would stick to them. I did some of them, forgot about others, and never looked at the list once between the day I wrote it and the day I looked it up to link to in this post. So when I saw Kim at Sophisticated Dorkiness posting about her One Little World project for 2015 (from Ali Edwards), I was intrigued. This, I thought, seemed like a better route for me than resolutions. This seemed like something I could do, something I could use to center my year and bring myself the focus that I've felt I've lacked recently. I kept debating whether or not this word was right for me, at this time, in part because it carries two significant meanings: 1) the opposite of dark; and 2) the opposite of heavy. But I kept coming back to it, again and again, because ultimately, both of those meanings are want I want to center on this year: focusing on the positive, on the illuminated, on the opposite of dark, while also reducing the burdens I place on myself, allow others to place on me, and the feeling of crumbling under the weight of it all, from to-do lists to just plain ol' stuff. While I'm at it, I even want to stop wearing so much black and grey. Anyone else doing One Little Word? Yes or no, what are you focusing on this year? What an EXCELLENT idea. I will have to save this and think on for what would be my word. I am so done and over with 2014, this might be a great way to stay the course for me. I love this. LIGHT was my word for last year, and I loved seeing where it led. (For me, mostly, it was about pursuing literal light on dark days, and trying to focus on the positive.) I hope it's a great word for you! Also: my word for this year is GENTLE. I'm so excited about it. Excellent! 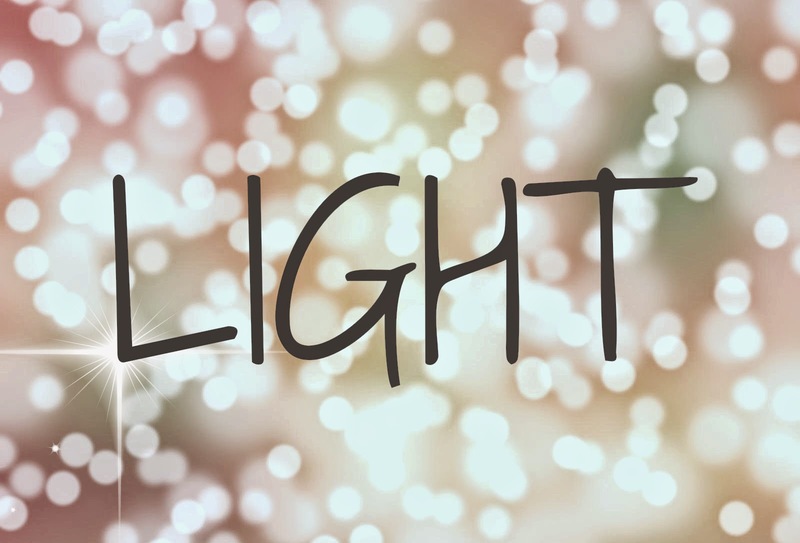 I like how many variations on "light" there can be... a lot for me is lightening up, but also finding the positive, and literally getting rid of burdens of things and lists and stuff. I like GENTLE, too. There's a lot of nuance to that. Here's to a gentle, light 2015! This is a great choice. Just wonderful. I liked that it wasn't a list of resolutions I'd inevitably forget; it somehow feels more manageable. I'd be interested to know what word you pick, if you pick one! Great choice, and I love your rationale for it! I'm doing this as well also thanks to Kim. My word is Gratitude actually for similar reasons to yours; I want to focus less on the negative, more on the positive. I love your quote - how motivating. I couldn't pick just one for my word so I made a collage :-) I'm loving the visual aspect of it so far, I feel like I can focus on my word any and all ways which take my fancy! Good luck with your word! I love this idea and you picked such a perfect word! Light is a beautiful word, and so powerful. I wish you all the best with it for 2015! I've gone through a few different words for what I want 2015 to be, too. Basically, my new motto is "Life is not and does not have to be as hard as I make it." This means so many things, including not being mean to and hard on myself in so many different ways, as well as not brushing off the good and not glorifying busyness and negativity, and not feeling guilty for going my own pace. So much, really, and some of the same stuff you mentioned. I thought of "peace," "calm," "halcyon," "kindness," and more, but none of these really hits the spot. "Alleviate" is another, which is close, addressing taking the pressure off, which will in turn mean relief, being myself, and so much less stress. If you've never heard of Danielle Laporte's Desire Map, you should check it out. It's related! Thanks! I'm hoping light helps me capture a lot of what you're talking about; that sense of giving up some of my burdens (both mental and physical). I liked how many variations on the definition I came up with (before I even looked up the formal definitions). I love the idea of reminding yourself, too, that life not only isn't but doesn't have to be as hard as we make it; so many of the pressures I feel I know come from within, not without, and it's important to recognize and remember that. Kim at Sophisticated Dorkiness had a really interesting post about "168 hours" that tied into this same idea. And I'll definitely check out the Desire Map--sounds interesting! Thanks! I liked how light can tie to everything from owning too much stuff (which I certainly do...) to wearing all black (which I also do) to placing too many burdens on ourselves (which I also do). I was just catching up on your blog last night and you already have a lot on your plate this year--new town!--so sending you best wishes for 2015 and beyond! Thanks! All credit to Kim at Sophisticated Dorkiness for turning me on to the idea in the first place. She has been quite the influencer on this! I like the idea of a collage, and think anything visual can help with the focus that this project can bring. I'm going to print and hang the word and my quote on my office wall. And maybe my bathroom mirror or similar as well, to make sure I see it and think on it, even for a moment, every day. Thanks! Looking forward to following along on your One Little Word this year to see how it goes for you!